Yesterday was Norway's birthday, May 17th. 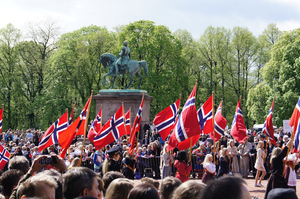 Throughout the country schoolchildren participate in colorful parades, celebrating 17 May 1814, when the Norwegian constitution was signed and Norway was finally declared to be a separate nation. 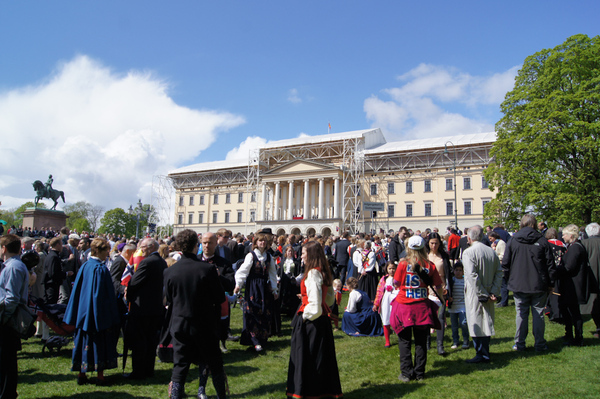 In Oslo, the barnetoget (children's parade) begins down by the water and winds uphill to the Royal Palace. It is the largest parade in the country; about 100 schools participate, and the number of spectators can reach 100,000! At the palace, the royal family stand on the balcony to inspect each school and band as it goes by. 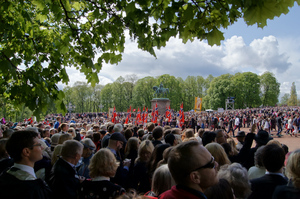 King Karl Johan, King of Sweden and Norway at the time the constitution was signed, also inspects the schools as they pass. 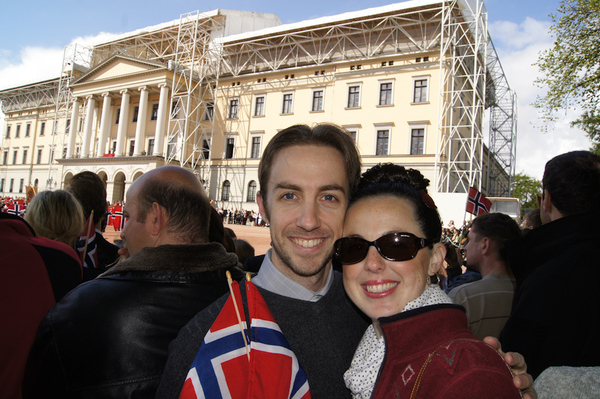 Norwegians are very patriotic, though not necessarily in the way I was brought up to think of patriotism in the U.S. Love of country simply laces every celebration. It's not strange to have a Norwegian flag displayed at a birthday or anniversary party, and Christmas decorations often include flag ornaments and ribbons. But on Constitution Day, flags run a red, white, and blue river all the way up Karl Johans gate. This means we get our own flags, too! The day also signifies the end of WWII in Norway, as occupying German forces surrendered on 8 May 1945. But it's worth noting that there is a complete lack of military might displayed on this day. 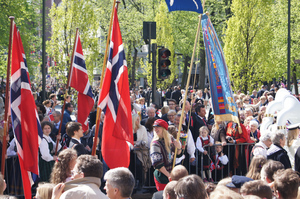 The parade focuses entirely on the children, Norway's future. They sing and play in marching bands. There are few things in this world as precious or as hopeful as a skinny, eight-year-old with blonde braids playing a wobbly, silver flute in the sunshine. 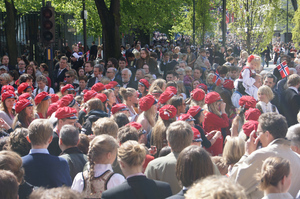 Native Norwegians wear their bunader , traditional costumes, as part of the day's celebrations. Bunader are unique to the region of the wearer's birth. They are different colors and styles, include a variety of pieces (caps, capes, boots! ), and are embroidered in different patterns. These outfits are made of heavy wool and often include strings of silver jewelry and other embellishments. People watching is such a treat on 17 May! Bringing up the noisy tail-end of the parade each year are the Russ! This is the next class of graduates, usually 18 or 19 years old. Sometime I'll go into more detail about the tradition of the Russ, but suffice it to say, I love that these kids get a chance to blow off steam at the end of their final school year. Before moving on to university and the responsibilities of life. Here you can see them wearing their signature bright red caps and overalls, adorned with their names in silver lettering and other bits of personalized flare. They blow whistles and whoop it up as they walk. It's their moment in the sun. A passing. A final moment of indulgence. 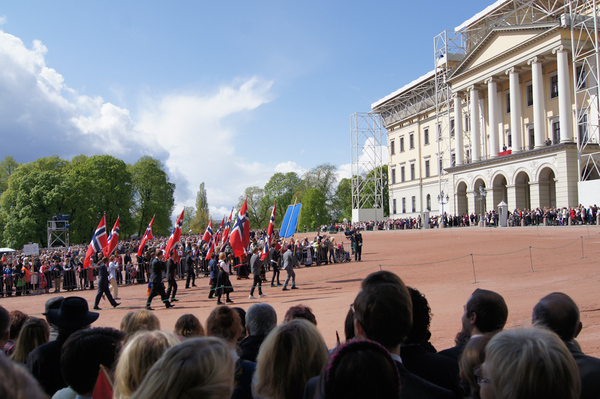 Last year, I neglected to blog our first 17 May experience in Norway. Then, we'd been living in-country less than a month. 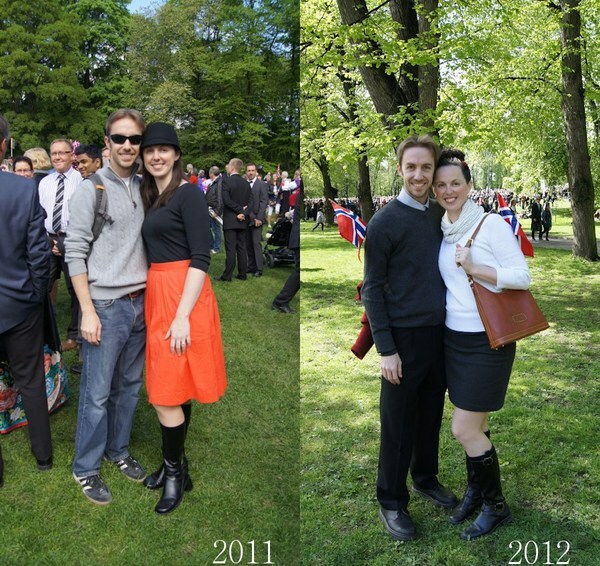 Now we've got more than a year under our belts, and we knew what to anticipate with syttende mai . Where before there was curiosity and observance, now there is appreciation and solidarity. Norway has been through a lot in the last year. It's comforting to see how time and peace and patriotism really do keep marching on.